As a member of a supervisory board, and even more as an acting CFO, I regularly have been and currently am involved in merger and acquisition projects – whether a company is considering buying other companies, selling parts of its own company, or merging with others. In all these cases, you have to evaluate the company or the part of a company you want to buy or sell. And even more importantly, you have to figure out if taking this step will add value to your company. On the 20th of June, I was invited to give a dinner speech at the 16th “Jahresforum Unternehmensbewertung” (company evaluation) organized by Handelsblatt and the Institute of Auditors in Frankfurt. 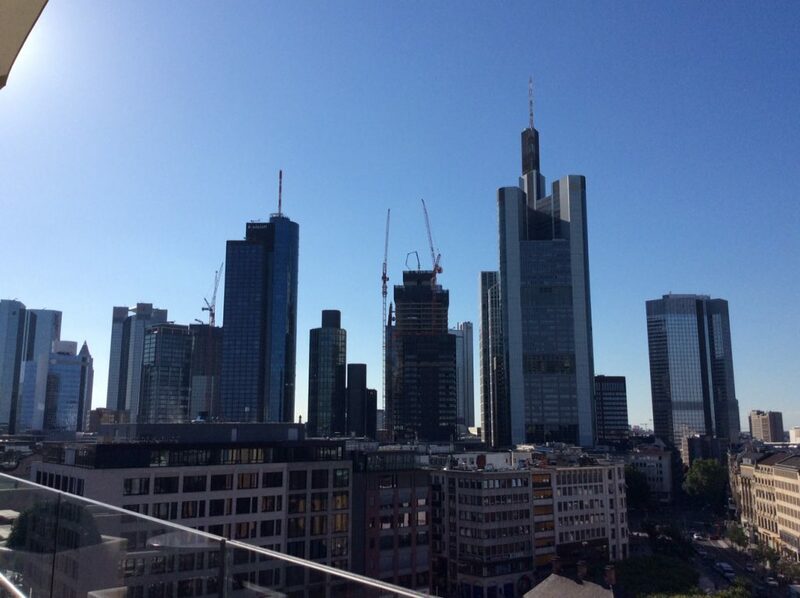 Giving this speech was a difficult task for me, as the participants were all experts in the area, knew more than I did about the topic, and the dinner was held on a roof terrace overlooking the Frankfurt skyline (see photo below!) on a beautiful summer evening. I knew this astonishing view would surely distract the audience, so I decided on an unusual approach to start off the talk: As my speech came after the appetizers and first drinks, but before the main course, my audience would already have drinks, food and chats on their minds. So I played up on that aspect. But what does a dinner menu have to do with mergers and acquisitions? Immaterial things like networking events and evenings are excellent examples. What is their value? We could take the monetary value of the food and drinks. Or the value of the energy we get from them, like the calories we consume, as a sort of future value we can take away. But is that all there is? Is it for example also of interest how the three courses in combination with the drinks fit together? Is the whole package more valuable than the sum of its parts? What about the people you meet, or the networking opportunities you have? Do they add value? Finally, how much value do the speeches add? Or do they actually subtract value, as they interrupt the evening, and you can’t spend that time either networking or enjoying the meal. And keep also in mind that you could have perhaps experienced something far better if you had attended a competing event. So, if everyone were asked to put a price tag on this evening, we would surely end up with a broad spectrum of responses. This situation is comparable to the one where you’re evaluating a company and have to decide whether you want to buy or to sell it. Thank God, you might say, there are scientific methods that can help! The first one is the objective method. You evaluate the substance of a company, taking all the assets into account and summing them up in a single value. The second is the subjective method, where you look at the earnings you will potentially make with the new company. A functional evaluation is also an option. It considers the different roles and various viewpoints from which you can assess the value of the company. Or do we take the market value, which is shown (at least for listed companies) in the market capitalization? At this point, I’m sure you’ve realised that there is no one right way to evaluate things, and for an evening as well as for a company, expectations about the future and potential further developments play a key role. New technologies and the value of immaterial things such as ideas or innovations can complicate the evaluation. With the growing role of data, how do we evaluate the data a company has and generates? Does data have a value of its own? Or does it only have a value when it is transformed into knowledge and products? Consider the recent development of cryptocurrency. At the end of May, we had 1,600 cryptocurrencies listed, with a market cap of 313 billion USD. This value is far less than what it was at the end of last year. As you can see, the pace of some technologies, innovations or regulatory developments is faster than the process of coming to a conclusion about a company’s value. In short, I don’t think we should simply discard conventional evaluation methods. But I also want to encourage you to take a risk when you are tasked with evaluating enterprises. As the future is becoming less and less predictable, the value of a company or a part of a company you want to buy depends very much on you, and your belief in the future of the company and how it fits into your own culture and portfolio. If you strongly believe that you can develop this company and you have a narrative for your employees and your investors, then it holds value for you. You have to verify this value with the aid of assessment methods and consultants, of course, but we should recognise that our gut feeling, and emotions have an impact on the value of things as well.”! I do not know if my speech finally added value to that evening or if the participants took parts of it as impulses for further discussions on the next day. I sincerely hope so. Previous: Previous post: Do we need different leadership styles to tackle the current global developments?